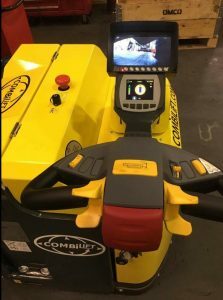 Combilift has been nominated as a finalist in one of the most prestigious and hotly contested international awards in the materials handling industry. From a large pool of applicants, just 15 products have been selected for the IFOY Award (International Intralogistics and Forklift Truck of the Year) which honors the best products and solutions of the year. The Combi-PPT powered pallet truck with 8,000kg capacity is one of three products shortlisted by the jury in the Warehouse Truck category. Combilift is the largest global manufacturer of multi-directional forklifts and an acknowledged leader in long load handling solutions. More than 38,000 units have been sold in over 85 countries since Combilift was established in 1998. Combilift continually invests 7% of all revenue in research and development as part of its relentless quest to find safer, more productive and more cost-effective ways to lift challenging loads in challenging environments. The company’s commitment to new product development continues to blaze a trail through the lifting and handling industry worldwide, cementing the company’s reputation as a global leader. Combilift employs more than 550 people and occupies a brand new, multipurpose-built facility spanning 46,500 m² in Monaghan, Ireland.